How can I make my layout fill my prints? One of the most powerful features in Simple Booth apps is the ability to get photos on your phone almost immediately, but at many events guests still love to be able to take a print home. In this article, we'll share some tips with you on how to get your prints just right. Settings for your layout, margins, and crop, as well as the iPad orientation will all affect how the images are printed from Simple Booth apps. The first step to a great looking print is to choose a layout that is similar to your paper size. It is possible to more closely match the layout by changing between portrait or landscape orientation, or turning on square crop. Adding a logo to the layout can help fill in remaining space. When it is appropriate, the app will automatically rotate the layout to better fit the paper. If there is room on the paper, Simple Booth will also automatically duplicate the photo strip layouts on your prints to get side-by-side strips. At this point, you should have a layout that is close to the print size, but may still have some extra margins. There are two ways to make your layout match up more closely with your paper size: print padding or by using Force Fit. The print padding feature in your prints panel allows you to make small, incremental adjustments to the layout’s position on the print out. Adding positive or negative values to the print padding settings will increase or decrease the margin thickness, respectively. Print padding works well in circumstances where your printer is cutting off part of your photo or the sheets are not aligned correctly. Read more about how to use the print padding settings here. We wanted to find a better way to get prints to match your paper size, so our team invented Force Fit - a simple and mighty tool to get great digital layouts and fit your prints perfectly, too. Force Fit crops each picture in the layout and alters the dimensions so that the photos fill the space with even margins on all sides. Simple Booth automatically detects faces in the photos and uses their positions to try to keep everyone in the frame! Force Fit will work best when your layout is already close in size to the paper size you have selected. The less cropping that is necessary, the better - but we will always make it fit! Force Fit automatically disables digital backgrounds and overlays added to the design panel to prevent distortion. This is because those graphics have to be designed to fit the dimensions of your layout or GIF, and those dimensions change when Force Fit is applied. This means you will need to design print-specific graphics if you plan to use Force Fit with an overlay or background. We suggest following these steps to ensure your prints, overlays, and backgrounds look great. Note that Force Fit will not disable logos and designing a unique logo for your prints will not be required. If you choose to print without using Force Fit, you will not need to design a print-specific background or overlay. Set the paper size you plan to use in the print panel. It may be helpful to use a ruler to measure the paper you are using, since not all paper will be exactly 4x6” or 5x7”. Any variances discovered early can make the next steps easier. 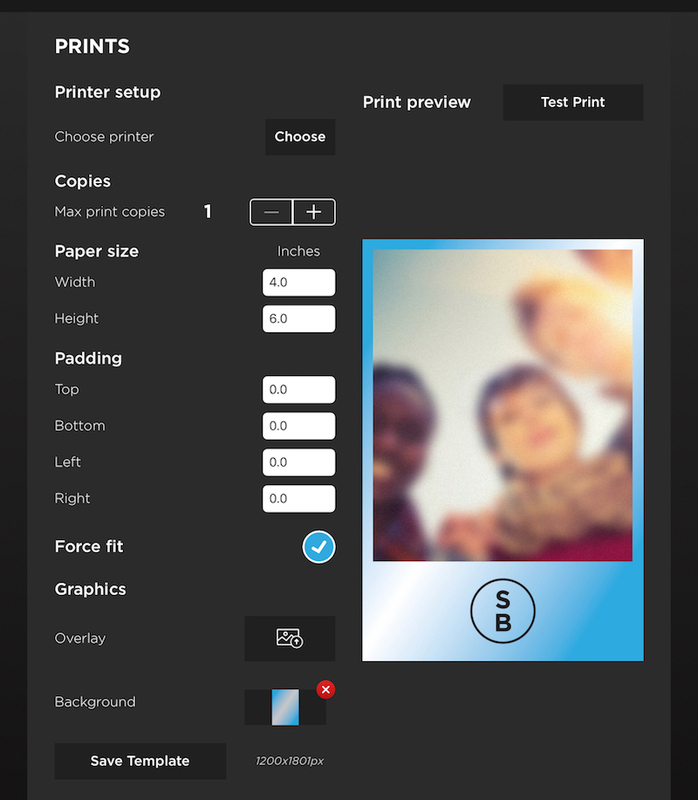 Enable Force Fit in your print panel and the layout's photos will be cropped to fit the paper size. Take a test print to ensure the layout is formatted properly for your printer’s paper. If it is not (i.e., part of the image is being cut off), you may need to add some padding to get things just right. Once the print is properly formatted, you are ready to start designing the print graphics. Press the “save template” button at the bottom of the print panel. Email, AirDrop, or use a cloud service (like Dropbox or Google Drive) to share the saved template to a computer so you can open it in your graphics editing program. Starting with the same graphics and elements from your digital overlay and/or background, adjust for print differences (i.e, the padding adjustments you made, or for side-by-side photo strips). Save the newly designed graphic and upload it to the print panel for your preset (be sure to remove the template you uploaded before saving). Take some test prints to ensure that the print graphics turn out as expected.